مقاله حاضر نخست به مسأله اهمیت و تأثیر مثبت اینترنت در زندگی بشر امروز می‌پردازد و در عین حال تهدیدهایی که درنتیجه حذف نشدن داده‌های شخصی کاربران در این محیط می‌تواند متوجه آنها باشد را مورد بررسی قرار می‌دهد. این مقاله سپس مسأله امکان حذف داده‌های شخصی از اینترنت که از آن تحت عنوان حق بر فراموش شدن یاد می‌شود را مورد مطالعه قرار می‌دهد و استانداردهای اروپایی در ارتباط با حفاظت از داده‌ها و خودمختاری اطلاعاتی را بررسی می‌کند. مقاله حاضر در پی پاسخ به این سئوال است که کدام چالش‌های نظری و عملی پیش روی حق بر فراموش شدن در حوزه‌های مربوط به شناسایی این حق و نیز اجرای آن وجود دارد و ضمن تجزیه و تحلیل رابطه میان حق بر فراموش شدن و آزادی بیان، به‌عنوان یکی از اصلی‌ترین چالش‌های پیش روی این حق، پیشنهاداتی را به‌منظور حل‌ تعارضات موجود میان این دو حق ارائه می‌دهد. - السان، مصطفی، حقوق فضای مجازی، نشر شهردانش، 1393. - انصاری، باقر، حقوق ارتباطات جمعی، انتشارات سمت، 1386. - پورقهرمانی، بابک؛ و علی صابرنژاد، حریم خصوصی در فضای سایبر از منظر حقوق بین‌الملل، انتشارات مجد، 1394. - حبیب­زاده، طاهر، حقوق فناوری اطلاعات: مقدمه­ای بر تجارت الکترونیک، جلد اول، مرکز پژوهش­های مجلس شورای اسلامی، 1390. 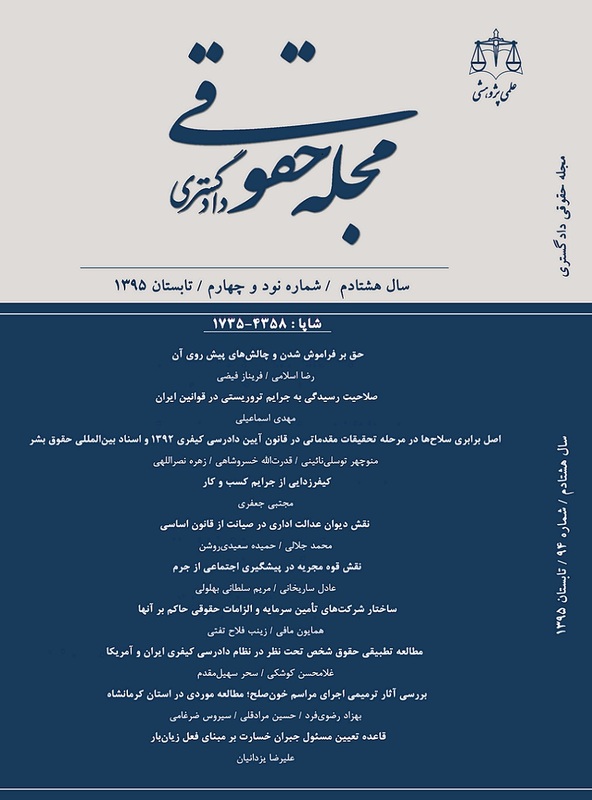 - قاری سیدفاطمی، سیدمحمد، حقوق بشر در جهان معاصر، جلد دوم، نشر شهر دانش، چاپ دوم، 1389. - موسی‌زاده، ابراهیم؛ و فهیم مصطفی‌زاده، «نگاهی به مفهوم و مبانی حق بر حریم خصوصی در نظام حقوقی عرفی»، دانش حقوق عمومی، شماره 2، 1391. - هیک، استیون؛ و اریک هوسکینز، حقوق بشر و اینترنت، ترجمه قاسم زمانی، انتشارات خرسندی، چاپ دوم، 1392. - Ambrose, Meg Leta,“Peaking of Forgetting: Analysis of Possible Non-EU Responses to the Right to be Forgotten and Speech Exception”, The 41st Research Conference on Communication, Information and Internet Policy, George Mason University, Arlington, USA, 2013. - Balkin, Jack, “Digital Speech and Democratic Culture: A Theory of Freedom of Expression for the Informational Society”, New York University Law Review, Vol. 7, 2004. - Bozovic, Miran, Jeremy Bentham and the Panocticon Writings, Verso, 1995. - Blanchette, Jean-francios; and Deborah Johnson, “Data Retention and the Panoptic Society: The Social Benefits of Forgetfulness”, The Information Society, No. 45, 2002. - Conley, Chris, “The Right to Delete”, AAAI Spring Symposium Series, 2012. - Declaration of Principles Building the Information Society: A Global Challenge in the New Millennium, World Summit on the Information Society, Geneva, Article 56, Document: WSIS-03/ Geneva/ Doc 4-E, 2003. - Dodge, Martin; and Rob Kitchin, “Suggestion for Designing Outlines of a World Coming in Existence, Computing and Ethics of Forgetting”, Environment and Planning, Vol. 34, 2007. - Flaherty, David, Protecting Privacy in Surveillance Society: The Federal Republic of Germany, Sweden, France, Canada and United states, University of North Carolina Press, 1989. - Foucault, Michel, Surveillet et Punir: Naissance de la Prison, Gallimard, 1975. - Gandy, Oscar, The Panoptic Sort: A Political Economy of Personal Information, Westview, 1993. - Google Spain SL and Google Inc. v. Agencia Española de Protección de Datos (AEPD) and Mario Costeja Gonzalez, European Court of Justice, Judgment of the Grand Chamber, 2014. - Iglezakis, Ioannis, “The Right to be Forgotten in the Google Spain Case: A Clear Victory for the Data Protection or an Obstacle for the Internet”, 4th International Conference on Information Law, 2014. - Joint Declaration on Freedom of Expression and Internet, International Mechanism for Promoting Freedom of Expression, 2011. - Koops, Bert-Jaap, “Forgetting Footprints, Shunning Shadows: A Critical Analysis of the Right to be Forgotten in Big Data Practice”, Tilburg Law School Legal Studies Research Paper Series, No. 8, 2012. - Korenhof, Paulan, “Forgetting Bits and Pieces: An Exploration of the Right to be Forgotten in Online Memory Process”, Tilburg Institute for Law and Technology Working Paper Series, No.4, 2013. - Lagone, Laura, “The Right to be Forgotten: A Comparative Analysis”, Fordham University Working Paper Series, 2012. - Land, Molly, “Toward an International Law of the Internet”, Harvard International Law Journal, Vol. 54, 2013. - Mandel, Toby; et al, Global Survey on Internet Privacy and Freedom of Expression, UNESCO Series on Internet Freedom, 2012. - Mayer-Schonberger, Victor, Delete: The Virtue of Forgetting in The Digital Age, Princeton University Press, 2011. - Mayer-Schonberger, Victor, “Useful Void: The Art Of Forgetting in the Age of Ubiquitous Computing”, Harvard University Faculty Research Working Paper Series, 2007. - McNealy, Jasmine, “The Emerging Conflict Between Newsworthiness and the Right to be Forgotten”, Northern Kentucky Law Review, Vol. 39, 2012. - Mitrou, Lilian; and Maria Karyada, “EU’s Data Protection Reform and the Right to be Forgotten”, 5th International Conference of Information Law and Ethics, 2012. - Murata, Kiyosh; and Yohki Orito, “The Right to Forget/be Forgotten”, Ethics in Interdisciplinary and Intercultural Relations, 2011. - Nunziato, Dawn, Virtual Freedom: Net Neutrality and Free Speech in the Internet Age, Stanford University Press, 2009. - Report of the Experts Meeting on Cyberspace Law, Monte-Carlo, Document: CII/USP/ECY/99/01, 1999. - Rosenne, Shabti, The Perplexities of Modern International Law, General Course of Public International Law, Nijhoff, 2003. - Shoor, Emily, “Narrowing the Right to be Forgotten: Why the Proposed European Union Needs to Amend the Proposed Data Protection Regulation”, Brooklyn Journal of International Law, Vol. 39, 2014. - Smet, Stinj, “Freedom of Expression and the Right to Reputation: Human Rights Conflicts”, American University International Law Review, Vol. 26, 2010. - The Promotion, Protection and Enjoyment of Human Rights in Internet, Human Rights Council: A/HRC/20/L13, 2012. - The Right to Respect of Privacy Family, Home and Correspondence and Protection of Honor and Reputation, United Nations Human Rights Committee, General Comment No. 6, 1988. - Thierer, Adam, “The Pursuit of Privacy in the World Where Information Control is Failing”, Harvard Journal of Law and Public Policy, Vol. 36, No. 2, 2013. - Warren, Samuel; and Louis Brandis, “The Right to Privacy”, Harvard Law Review, No.4, 1890. - Werro, Franz, “The Right to Inform V. The Right to be Forgotten: A Transatlantic Clash”, Georgetown University Research Paper No. 2, 2009. - Westin, Alan, Privacy and Freedom, Bodley Head, 1967. - Zittrain, Jonathan, “Be Careful What You Ask for: Reconciling a Global Internet and Local Law”, Harvard Law School Public Law Research Paper, No. 60, 2003.